I believe email lists are vital to online business owners trying to sell things to an audience. But before you start one you should understand the importance of it and why you should have one in the first place. Because just having an email list doesn’t mean much. It’s how effectively you make use of your email list that counts. 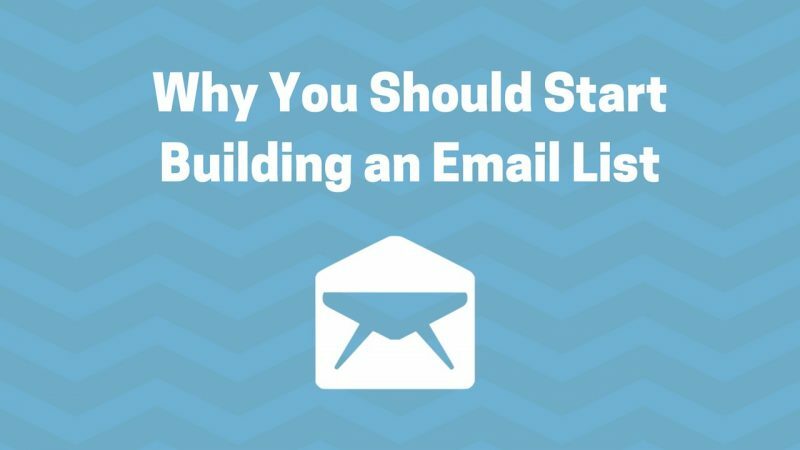 If you’re ready, let’s dive into the various points I’ve come up with to convince you the importance of starting to build your email list TODAY! Think about a social media platform like Facebook for a minute. Years ago, Facebook conned marketers, bloggers, and business owners into starting a Facebook fan page for their businesses. Everyone put tons of energy into building their page likes / followers. Here we are in 2018, and Facebook pages are almost worthless unless you pay for ads to boost your posts. Only a small percentage (2-4%) of your fans actually see the content you post to your page. This is one reason why email lists are great to have instead. You can guarantee your content will get to them with email instead of worrying about a social media algorithm that decides to only show certain content to certain people. You control your email list. It’s all yours. So even if Facebook shut down tomorrow for some reason, you’ll still have an email list full of dedicated followers who are there to open your emails and read your most important updates. Do you ever get on social media with the intent to look for ads to click on? No. Nobody does. In fact, now days we are trained to skip or ignore ads we see as we scroll through our feeds on Facebook, Twitter, and Instagram. Instead, we get on social media to interact with our friends, connect with other influencers, find entertaining videos, etc. Not to shop for products or services. A recent survey showed that people are more interested in receiving product offers via email than through social media. Email is proven to convert followers into customers at a higher rate than other platforms and media types. According to Direct Marketing Association, email marketing on average sees a 4,300 percent return on investment (ROI) for businesses in USA. But first you need to get someone’s permission to email them. You do this by offering an opt-in form on your website or landing page. Once they’ve entered their info and opted in to your list, you now have permission to sell to them. However, you should do it in a non spammy way. People hate getting spam in their inbox and you’ll quickly find your emails not being opened if you’re not careful with your approach. I often deliver a value packed email and at the end share a resource or product offer I think the subscriber would be interested in checking out as a bonus. Email subscribers are often much more loyal than followers on social media. They’re more picky about who they subscribe to via email than who they follow on social media. So once someone is part of your email list, you know they’re into you and the content you’re putting out. For those reasons, it’s incredibly important to take care of your email subscribers. Not only are they going to be your most engaged blog readers, but they’ll also be your most loyal customers. This is your tribe. And your email list is their headquarters. This is important when you have an announcement you want to make about a product you’re selling. With email, you can send a broadcast email out to your entire list and guarantee it gets to their inbox. How many of your subscribers actually open the email and see the message is another factor. On the flip side, your social media followers may not log on every day. And those who do get on daily could still miss your post if they aren’t on at the right time. For example, many tweets sent out on Twitter in the morning are never seen by those getting on later in the afternoon. With email, you can rest assured the message is sitting in their inbox waiting for them when they open it up to check all their emails. Not only is it easier to send out content to people through email, but you can send out the RIGHT content to the RIGHT people. It’s a more targeted form of communication. With my email list, I have subscribers grouped into different buckets based on their interests. This allows me to send them emails most relevant to their interests, thus building a stronger connection and increasing open rates of these emails. It’s also more personal. A subscriber feels like you’re talking to them direct unlike social media when they see a general post that went out to all of your followers. To make emails personal, you can often times insert their name into the email using code that says “First Name” depending on which email service provider you’re using. Wanted to drop in today and share my latest YouTube upload with you that I think you’ll find helpful if you’re trying to build your blog readership and increase website traffic. You’ll notice the code I inserted next to “hey” and what this does is inserts the first name of every subscriber in their own personal email. So if I have a list of 1,000 subscribers I send this email to, then all 1,000 will receive their own personal email that has their name in it. If you’re curious about some other advanced features ConvertKit offers, check out their website here. Who Is Email Not For? I believe email lists are important for any business minded person. But if you don’t have the intention to sell a product or service to your email list, then this may not be for you. However, you can still use email to share your articles and communicate with your fans as discussed via the points above. Ideally though, email marketing is for those trying to monetize their audience and earn an income selling products or services. I’ve created a step by step training course on how to use ConvertKit if you’re new to email marketing and want a guide on how to set up your email marketing system. ConvertKit is an awesome email service and has many amazing features not offered by other companies. Plus it’s affordable!